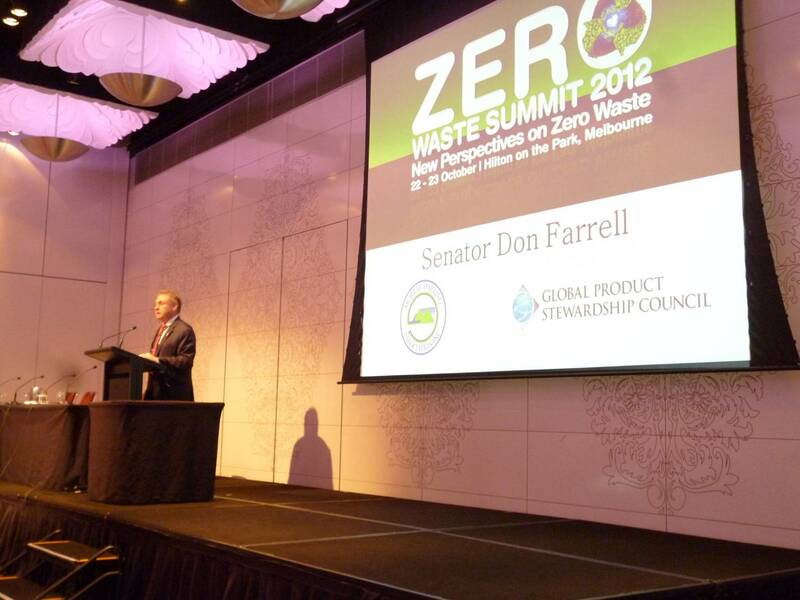 Australia’s Parliamentary Secretary for Sustainability and Urban Water, Senator the Hon Don Farrell, addresses the Zero Waste Summit in Melbourne, Australia. Senator Farrell, who led the passage through Parliament of Australia’s Product Stewardship Act 2011, cited bipartisan support for the Act and updated attendees on product stewardship developments in Australia, including the new TV and computer recycling scheme. Global Product Stewardship Council President Russ Martin chaired the first day of the Zero Waste Summit and presented the GlobalPSC perspective on global developments in product stewardship. Other speakers on product stewardship included representatives of the Australian Government, Fuji Xerox, ANZRP and Australian Packaging Covenant. The GlobalPSC was a proud supporter of the Summit. The Australian Government has worked in collaboration with the GlobalPSC, from being one of the GlobalPSC’s first government members and an International Speaker Sponsor for the inaugural International Product Stewardship Summit, to seeking GlobalPSC input into the development of product stewardship legislation. We are certainly grateful for the Australian Government’s ongoing support.